← Too High or Too Low? 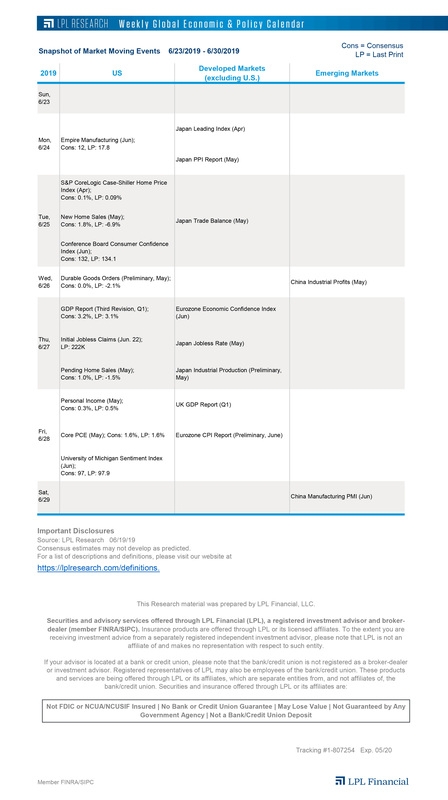 Another round of upbeat China data. Targeted stimulus appears to be working following a series of better-than-expected data that included first quarter gross domestic product growth at +6.4% from the year ago period, ahead of consensus expectations for a 6.3% increase and in line with the prior quarter. Industrial production rose 8.5% year over year, topping analysts’ estimates (+5.9%) by a wide margin, while retail sales‘ 8.7% year-over-year growth was above the 8.2% seen earlier this year. Officials are now reportedly considering additional stimulus to boost auto and electronics sales. Pushing past the highs. U.S. stocks are nearing record highs for the first time in more than six months as the S&P 500 Index sits within 1% of its record high. A lot could be priced into equities now, though, and it’s becoming difficult to see what could push them decisively past the highs. In today’s LPL Research blog post, we’ll identify some potential surprises that could drive the next leg of U.S. stocks’ gains, along with some potential disappointments that could deflate this impressive year-to-date rally.